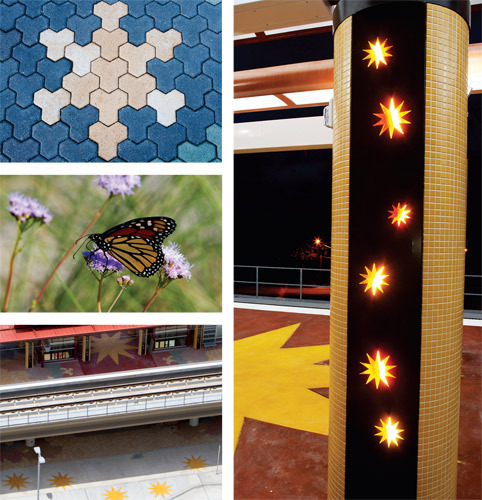 The yellow platform columns also use the spark motif, with a light source behind the image so that the sparks shine a bright red at night. At the platform and concourse levels, abstracted tree trunk and leaf designs extend from the elevators to represent the contrasting static and mutable nature of the pursuit of knowledge. For the color scheme, Munguia sought inspiration from the community, borrowing from the colors of older neighborhood homes for the earth-toned pavers. To symbolize the influence Latinos had on the community, the artist used bright colors on the stairs, columns and canopies. In summary, Inwood/Love Field Station does more than open doors to destinations. It opens minds!